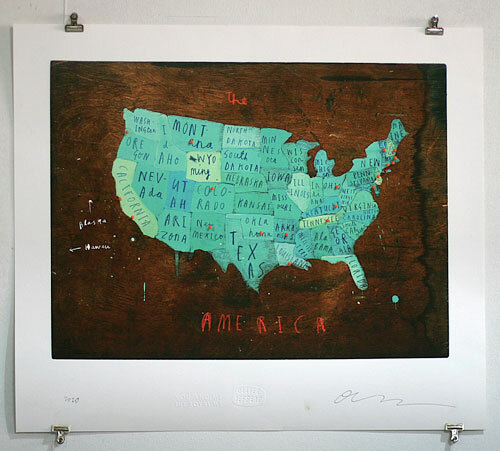 I'm dazzled by this print created exclusively for the Royal We by Oliver Jeffers. 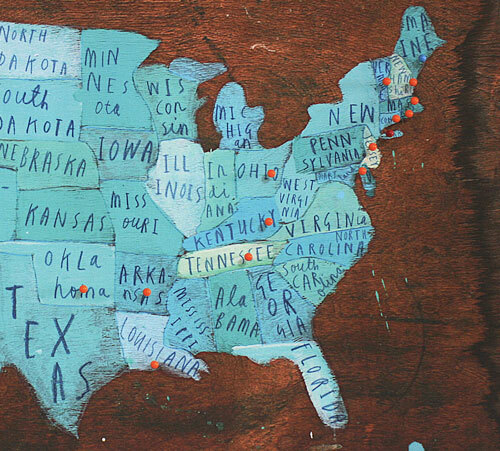 Each print comes with you pins so you can track the states you've been to and where you want to go... Perfect. Find them here for $120. Love that you can personalize it! So pretty and creative! I love how he even squeezed in the names of the little states! i love everything about this, except one thing: i wish it was larger, a bit more on the super-sized scale so it could take up a whole wall or something, that would be cool. Stunning--I would love to have one (and to be able to pin-it up the wazoo). Ahhh that map is so so cute! Ah! I think that shade of blue/green is gorgeous, and I love the ruggedness and simplicity of it. I love maps! This one is darling.